Kids’ Fun and Fitness Everyday–No Matter What the Weather Brings! We make kids’ fun and fitness a priority in our homes, because we know the pay-off…good endorphins, alertness in the classroom and healthy, happy kids! So today, here are some great ideas for indoor activity that will bring great fitness. The American Heart Association recommends that kids get at least 60 minutes of moderate to vigorous physical activity every day, and not just to wear them out before a nap or bedtime: regular exercise increases a child’s self-confidence, physical coordination, self-esteem and psychological well-being. However, busy parents with demanding schedules may struggle with modeling healthy fitness behaviors for their children; families living in small, sound-sensitive spaces — like an apartment or duplex — need help keeping kids active without being overly noisy. And if you have a new baby who keeps you occupied at home while older kids grow bored and need to burn off some energy, what’s a mom or dad to do? 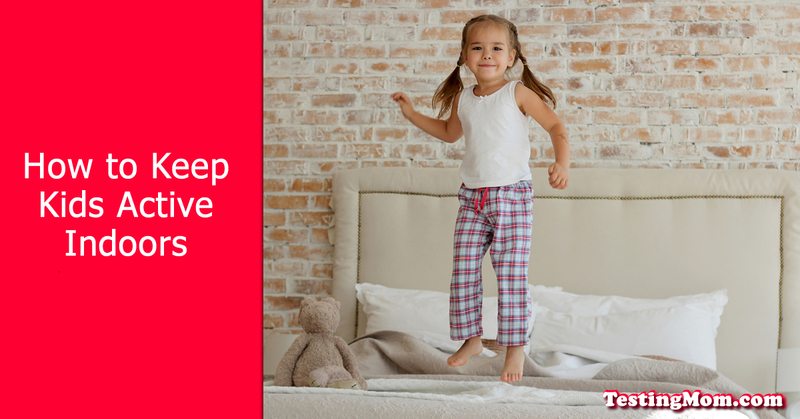 Try these ideas for helping kids stay active, both in and out of your home! Put baby in the stroller and head to the aquarium, museum or zoo. Walking is perfectly fine, and your older kids will be enthralled by the animals, exotic fish, art and other interesting things that they don’t see at home or in school. This is a great way for you to get in some steps and wear the kids out while keeping their minds engaged in language-rich experiences, which you can talk about for days afterward. None of these options nearby? Find an outdoor park with a playground or ask a parent friend with a closed-in backyard to host a play date, if that’s an option for you. Ask when your neighbors won’t be home (or are OK with some noise) and schedule “family dance parties” during those times. This idea has hidden benefits — your neighbors will appreciate your effort to work around their schedules and get to know you better — and some obvious ones, like being silly with your kids while you dance around the house to their favorite tunes. Let each child pick two songs and choose a couple for yourself, then rotate to create each day’s “party playlist.” It keeps things fresh and lets your child exert some control while you enjoy some quality family time together! Planning a birthday party? Host it in an activity-friendly space! There are plenty of indoor play spaces for rent that are happy to host parties for kids aged 3 and up, like Pump It Up, Jump Zone, Kidville or Gymboree Play & Music. You can usually find an arcade, mini-golf course, rock-climbing gym or bowling alley locally that will host parties for older kids, too. What You May Not Know–TestingMom.com has an Interactive Online Game Just for Your Active Child! Did you know there’s a great, get-active option available on our site? It’s true! All TestingMom.com memberships include access to our Skill Building Academy, and in our Skill Building Academy your child will be able to access the premium Go Noodle program: a fun, interactive way to help kids get the wiggles our and refocus their minds! Here, your Kindergarten to 6th grader can engage in movement and content-building for lots of fun and great exercise. Combined with the dozens of other educational games and partner sites, these programs should keep any kid’s mind and body equally active!